Zenzo Ngqobe is a South African actor best known for his starring role as Stone Khuse on the e.tv soapie Rhythm City, from 2007-2012. He has featured in the movies Tsotsi (2005) and Blood Diamond (2006), and appeared in the TV hospital dramas Jozi-H and Hillside. He also appeared in the stage productions of Township Stories and Cards, among others. Zenzo hails originally from Mafikeng, would like Denzel Washington to depict him if a movie were to be made of his life, says his Timberland boots could be the most expensive item he’s ever bought and that samp and malamogodu is his favourite meal. His greatest passion is his work - and everything that strengthens his soul. What gets him out of bed in the morning: "Knowing who I am and not knowing what I may become". 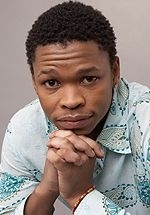 In April 2012 he was fired from Rhythm City, reportedly for being unreliable. In 2013 he took over the role of Cyril from Gideon Lovinga in the SABC2 sitcom Ga Re Dumele, replacing him after the first five episodes of Season 3 and for Season 4. He was previously in a relationship with fellow actress Nokuthula Ledwaba.